You may have heard about BAM Jam and have even seen some details. (If not, click here to see all the tourney info). Here are 5 great reasons why you should consider putting a team together. OK, this one was obvious. Clearly if you are considering playing in a 3 on 3 tournament then you must love the game. 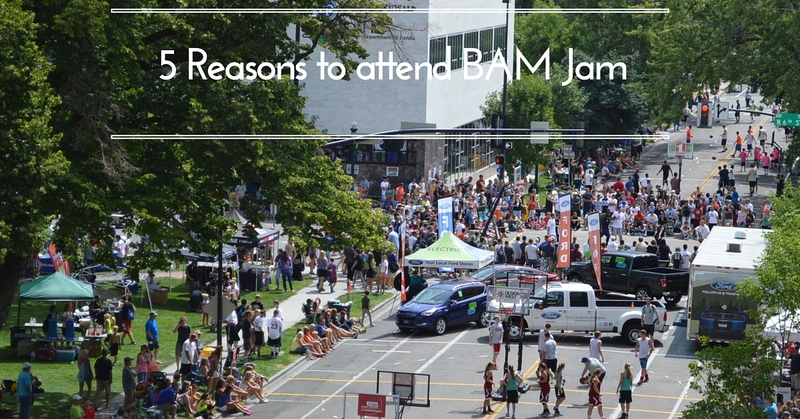 BAM Jam was created to bring a celebration of basketball to the streets of Boise, Idaho. For two days you get to play games, watch games, talk hoops and absolutely soak up as much basketball as you can handle! Each team is guaranteed at least 3 games in the summer BAM Jam. That means plenty of opportunity to get in some exercise. You could go to the gym or get out and go for a run, but basketball offers a chance to get and stay fit in so many different ways. It will challenge your strength, endurance, quickness and mental toughness. We all love to hang out with our friends. Especially when we get to hang with them while doing something fun. BAM Jam is the perfect chance for friends and family to get together and have a great time. Is there anything better on Monday morning than having a great weekend story to tell? Teams at BAM Jam always leave the tournament with some great memories and stories. No matter how the tournament goes, you always have your friends! BAM Jam gives players and fans the ultimate streetball experience. In adition to "Hoop City" on the streets of downtown Boise, the tournament is located next to Capitol Park and the Idaho Capitol Building, home of the Powerade Slam Dunk Championship. In addition to every court having its own Court Monitor, almost every court has significant shade provided by all the trees in the city. It's not an accident that the city's nick name is "The City of Trees". With over 10,000 people coming to watch the tournament, you'll definitely get the feel of a huge event but with plenty of room to move around. The BAM Jam environment is like nothing else. BAM Jam is more than just your chance to play some 3 on 3. During the tournament, players and fans get a chance to watch the Powerade Slam Dunk Championship and anyone can try and qualify for the finals of the 3-Point Challenge. All day long there are Elite games being played on the College of Western Idaho Center Court, featuring the players in the tournament. Capitol Park features great food and some cool booths, including the Treasure Valley Ford Stores area where they give out a ton of free stuff. Outside of the tournament, downtown Boise provides so much for players to do while waiting for their next game. There is a great farmer's market on Saturday morning and the Old Boise area features great shopping and dining options. Click here to check them out. If you are ready to sign up,click here to visit the team registration page. Or you can also join our email list by simply texting BAMJAM to 22828.